Whether travelling for business or pleasure, people with disabilities desire an experience made memorable by ease of access rather than logistical nightmares. This is especially true when it comes to lodging. In the United States, most major hotel chains have rooms designated for people with disabilities, eliminating many concerns of suitable access. Until recently, however, there were no internationally focused, hotel vetting services for the intrepid traveler with an eye toward travel beyond the U.S. Marlies van Sint Annaland, CEO and Founder of Accessible Travel Online (ATO) has changed that. Now, seeking, finding, and booking an accessible hotel is as easy as point and click. To properly vet hotels, Van Sint Annaland relies on a small group of advisors and personal contacts who gather the hotel information ultimately appearing on the site. This differs from the model used by most travel rating services that typically list the experiences of travelers who have stayed in a particular hotel. ATO advisors are selected specially to look for ways in which the hotel serves people with disabilities in its hospitality profile. reliable information can be. As she explains, “Experienced travelers with a disability themselves, is the basic starting point to join the ATO team. Our motto is not to talk about disabilities, we talk about abilities. I never ask people why they are in a wheelchair for instance. It’s obvious, right? So, we make sure we can take away barriers and focus on the possibilities. Melanie and Mirjam, who coordinate the HotelCheck procedure, are trained experts in hospitality and are very good in motivating others to share their skills in endurance, positive thinking and helping others. Helma singlehandedly changed the law in the Netherlands, making sure assistance dogs are never to be refused on any property. Representation with advisors in the USA is coming soon. 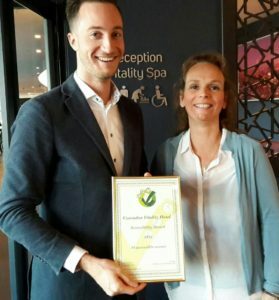 This hotel, whose website is https://www.corendonhotels.com/corendon-vitality-hotel-amsterdam, offers many accessible rooms. She says, “We have worked with the Corendon Vitality Hotel in Amsterdam from the start, before it was built! They have two accessible rooms on each of the seven floors. Going forward, ATO plans to focus expansion in areas where they have already made successful inroads. But this does not mean that newer inroads will not also be made. In the spirit of its slogan, “Travel without Limitations,” the company has recently begun a U.S. operation to further ease the paths to worldwide travel. In fulfilling her dream, Van Sint Annaland has helped others fulfill theirs. ATO offers a map of possibility for travelers with disabilities, who are well-accustomed to knowing their limitations and then defying them.